Design and send marketing postcards in minutes. Access 160 Million residential addresses to create local marketing campaigns in the neighborhoods where you want to get business. Use our intuitive map to select your target neighborhood and the number of residences. Choose from a variety of templates. Add a photo of your work, an offer and your contact info. We print the postcards, lick the stamps, get the addresses and send your postcards. Use the map to see the exact target area for your postcards. Use your current location or enter an address. We work with industry-leading data aggregator to validate the addresses before sending the postcards. Our marketing and design experts have created postcard templates that are bound to leave an impression and land you more leads. You are proud of your work and a picture is worth a thousand words. Snap a photo with your phone, add it to the postcard and let your work speak volumes. We use premium paper and the latest printing technology to make sure your postcards have a strong impact. All orders placed before 10am PST (1pm EST) are printed and mailed the same day. Let us help you get the word out quickly. Free to Download. Get started today. Where can I download Neighborhood Postcards mobile app? Neighborhood Postcards is available from the iTunes app store and Google Play Store. What devices does Neighborhood Postcards support? Neighborhood Postcards is available on iOS and Android based devices. 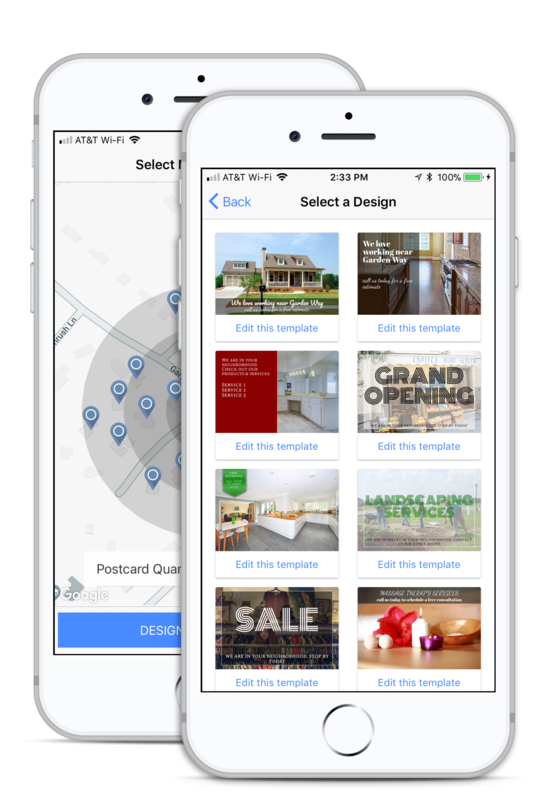 Neighborhood Postcards enables the user to create and send a marketing campaign in three simple steps. First, the user selects a target location. This can be your current location or any other address. Second, the user selects the quantity of postcards to send. Third, the user designs the card, picks from a set of high-quality postcard templates, uploads a photo, adds the business contact information and places the order. How does Neighborhood Postcards know my location? Neighborhood Postcards uses GPS coordinates of your mobile device to determine your current location. You will have to grant Neighborhood Postcards access to your location when using this app for the first time. When you see the following pop-up message “Allow Neighborhood Postcards to access your location while you use the app?”, please click Allow. Is it possible to enter a specific center point for my postcard campaign? Absolutely. Neighborhood Postcards allows you to enter an address that will serve as a center point of the Neighborhood Postcards' campaign. Location-aware address validation will automatically recommend the most likely address, so you will only have to type the first few letters of the address to get started. What neighborhoods should I target with my postcard campaign? Consider neighborhoods that have the highest number of potential customers. A building contractor might want to target a neighborhood that has homes of a certain age. A dog walker might want to market to a neighborhood along an existing route. A landscaper could consider targeting neighborhoods with housing lots over a certain size. How does Neighborhood Postcards determine the target recipients of the mailing? 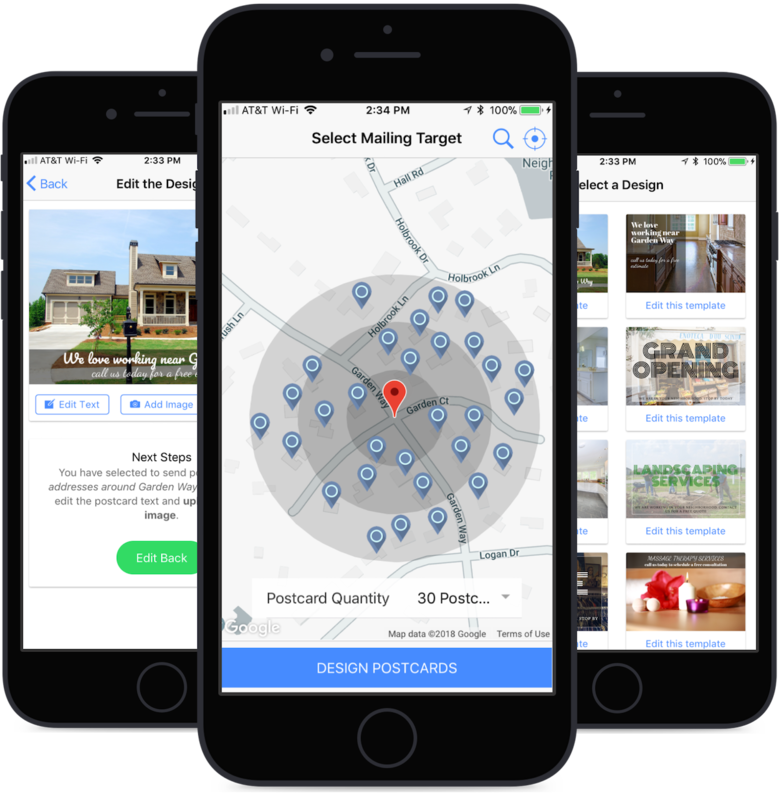 Neighborhood Postcards searches for up to 150 addresses closest to the target location you’ve selected. Is it possible to download the address list of where the postcards were sent? We don’t currently offer this feature, but might consider offering it at a later time. Is it possible to feature my own photo on the postcard? Yes. In addition to seasonal and industry-specific templates, Neighborhood Postcards' templates allow you to prominently feature a photo (or another custom graphic) of your choice. Please remember that the postcards will be trimmed approximately 1/8 of an inch from the edge of the document. What types of photos should I include on the postcard? We recommend using photos that demonstrate the quality of your product or service, such as work recently completed in the neighborhood. You might also consider featuring a photo of your store or some of the products you sell. How much text can I include on the postcard? There is not a set limit of how much text can be put on a postcard. Neighborhood Postcards attempts to intelligently position the text on the postcard and will decrease the font size to allow for more content. As you design the postcard, you will see a digital rendition of it in real time. All templates allow for a prominent call to action on the front of the postcard. In addition, the back of the postcard has a pre-filled textbox with boilerplate text about your business. There are also fields for detailed contact info. Can I add an offer? What makes a good offer? Yes, we recommend adding an offer. There is a place on the front and back of the postcard to add the offer text. Perhaps, you could tell customers about an upcoming sale, a grand opening or a new product. If you run a service-based business, the offer could be about a free estimate or about a discount for first time buyers. A good offer builds excitement about your business and gets people to try the product or service. Payment can be made by Visa, MasterCard, American Express, JCB, Discover, and Diners Club. When would my credit card be charged? Your credit card will be charged within 24 hours of placing the order in Neighborhood Postcards. The charge will appear as Stripe*NeighborhoodPostcards. Can I send a copy of the postcard to myself? Yes. After placing your order, we will send you a confirmation email with a link to request a free copy. We will send a free postcard to the address you have specified at the same time we ship your order. As a rule of thumb, this is a good way to know that the postcards have arrived in the mailboxes of target recipients. What is the paper quality and the dimensions of the postcard? The postcard is printed in full-color on Premium, 14pt. glossy card stock. The postcard dimensions are 6.0" x 4.0" (152 mm x 102 mm). When will the postcards arrive? We print and ship the postcards within 24 hours. With United States Postal Service First Class shipping, the postcards will arrive within 4-6 days after the order date. We cannot guarantee the exact date as this is dependent on the postal service. How are the postcards mailed? Neighborhood Postcards are mailed using the First Class United States Postal Service. I did not receive the confirmation, how can I track my Neighborhood Postcards' order? Please contact us and we will be happy to track the order for you. Please note that a personal copy of the postcard can be sent for free to the address of your choosing. I changed my mind. How long do I have to cancel my order? We always seek to provide the highest quality of service possible. Order cancellation and a credit can be issued only within two days of the order. Please contact us to cancel your order. What if I don’t like the quality of the postcards? We would love to hear your feedback and will do our best to make sure you are satisfied with Neighborhood Postcards. Please reach out to us by sending us an email. How do I get notified of the new updates? Please visit our website http://www.NeighborhoodPostcards.com periodically to see all of the new updates. If you have any additional questions or comments, please send an email to support@neighborhoodpostcards.com.